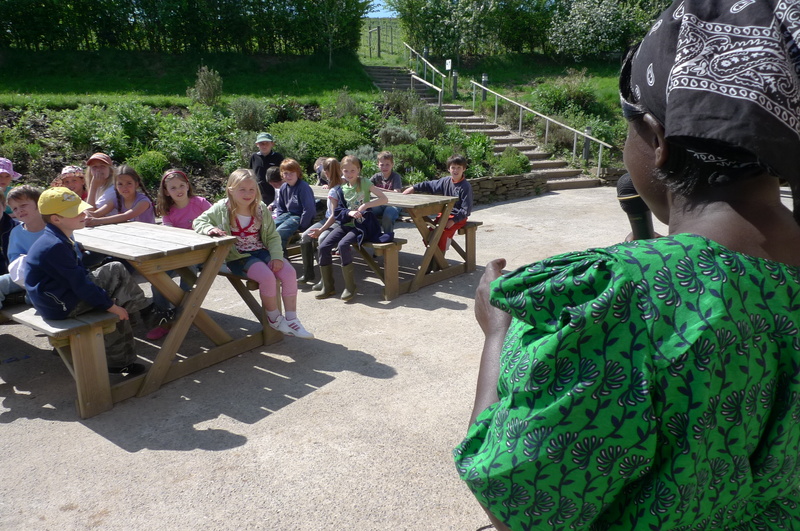 We’ve been hosting Charles, a Ugandan farmer at our farm in Devon for the past two weeks. 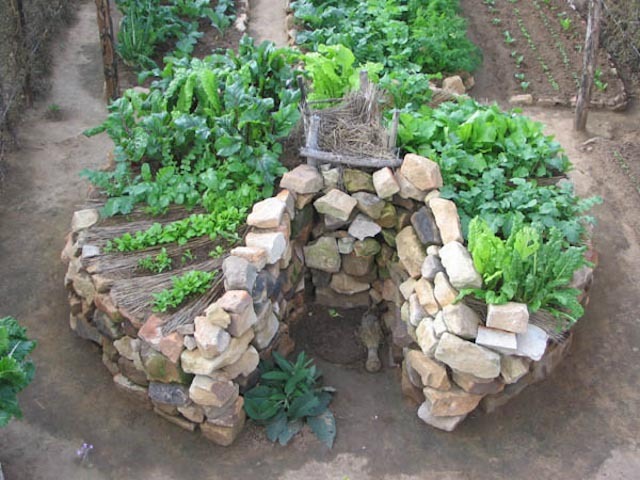 Join Guy as he takes a look at his creative farming methods (3 min 50 sec). 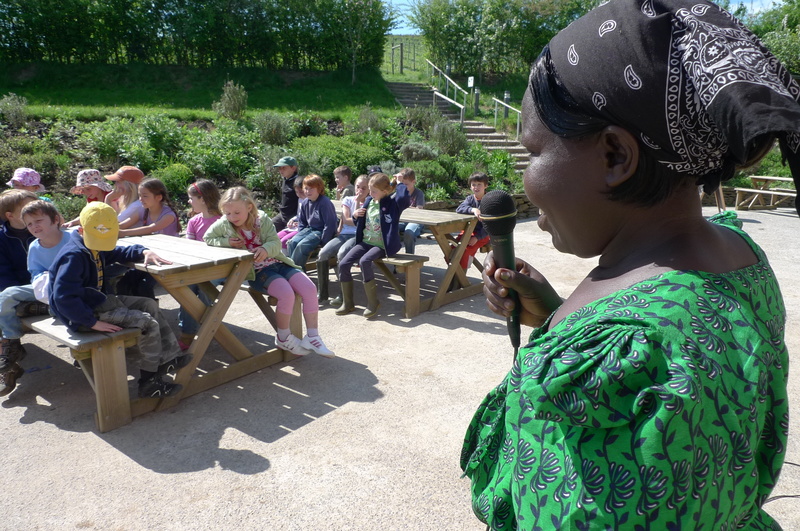 As part of our work with Send a Cow, Ugandan farmer Margaret Kifuko visited our farm in Devon for two weeks (see our original post about our events here.) 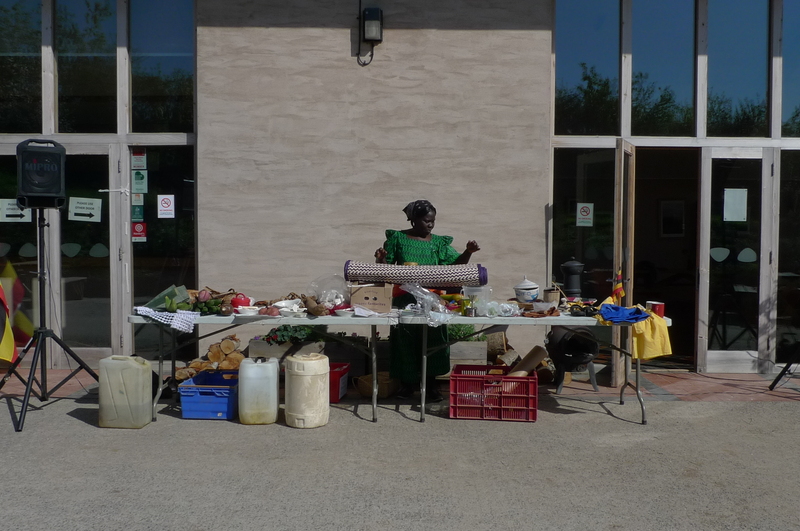 Today is her last day with us, so here are some photos of Margaret during her time at Wash farm. 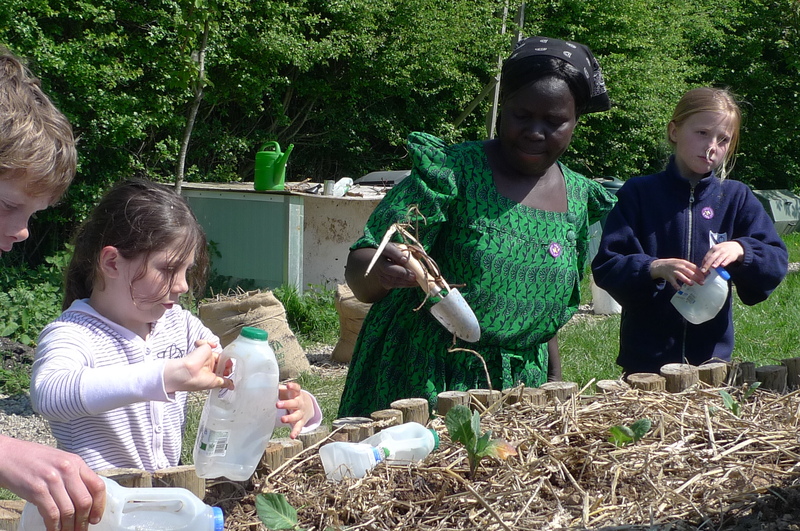 We’ve been working with Send a Cow since March last year, organising joint events promoting sustainable farming practices globally and offering vegbox incentives for donors to the charity. 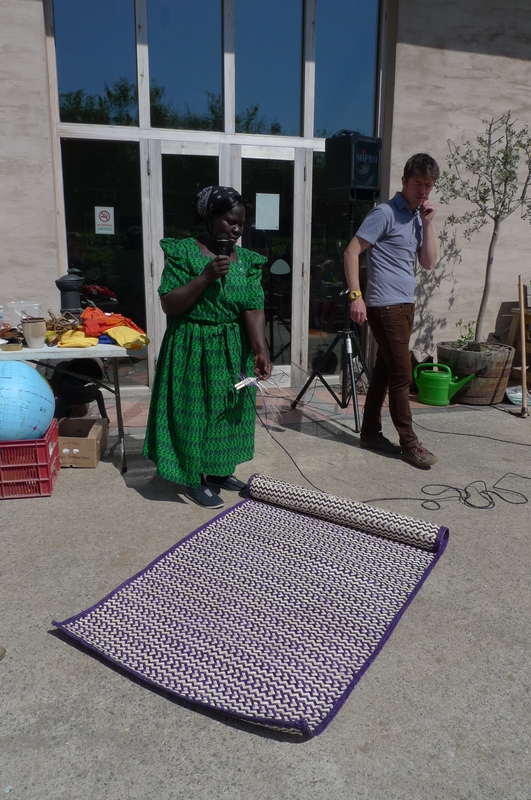 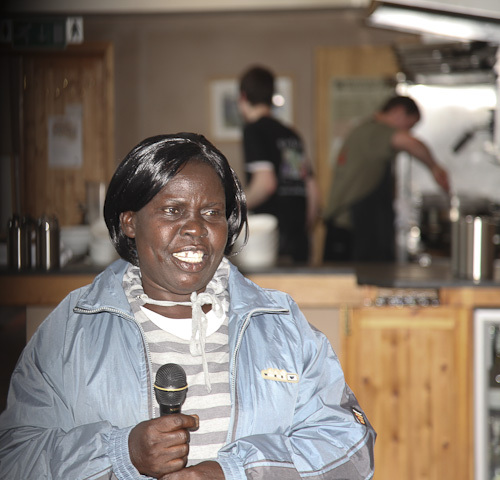 Devon on Monday 3rd March with our guest Ugandan farmer Margaret Kifuko. 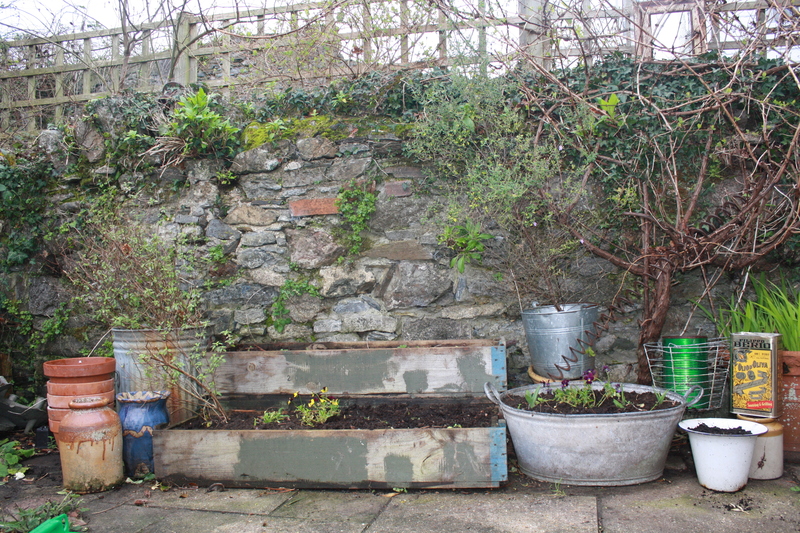 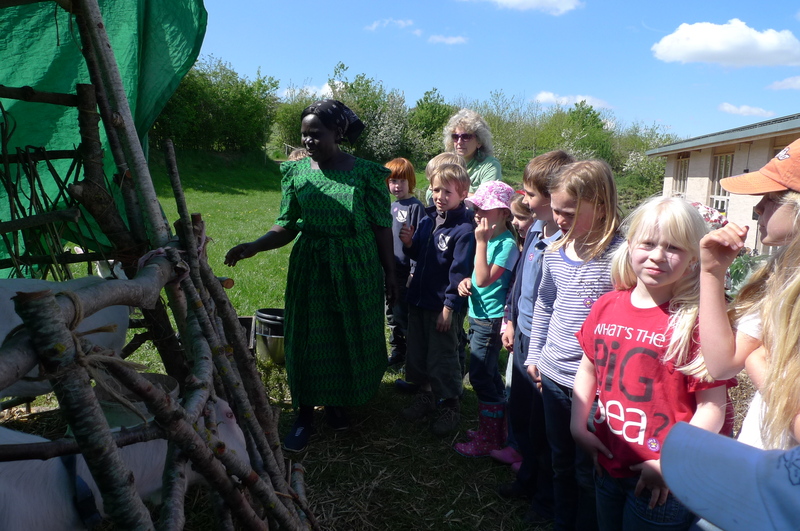 Margaret taught everyone about keyhole gardens and bag gardens and we had farm walks and goats for everyone to meet. 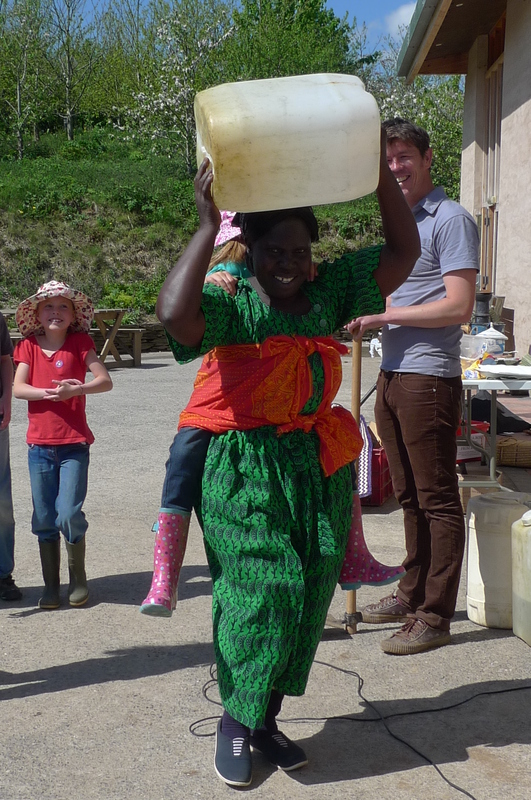 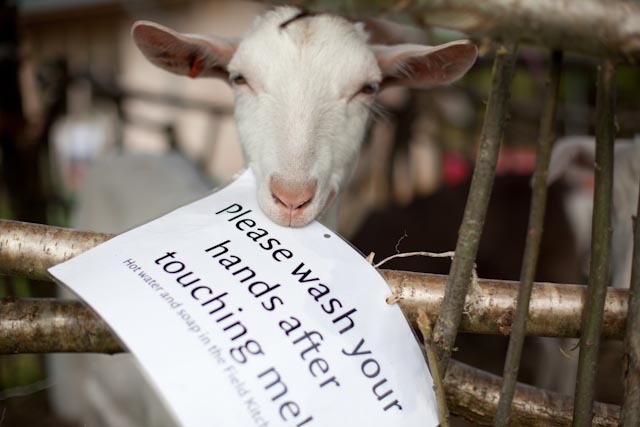 On Tuesday 4th May we held an evening hosted by Guy Watson (Riverford Founder) and guest speaker Margaret at the Field Kitchen on Wash Farm, Devon. 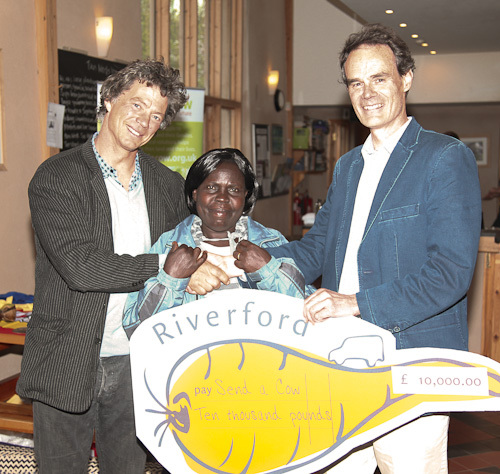 Martin Geake (Director of Send a Cow) received a carrot-shaped cheque from Riverford for £10,000 which was raised from various initiatives over the last year. 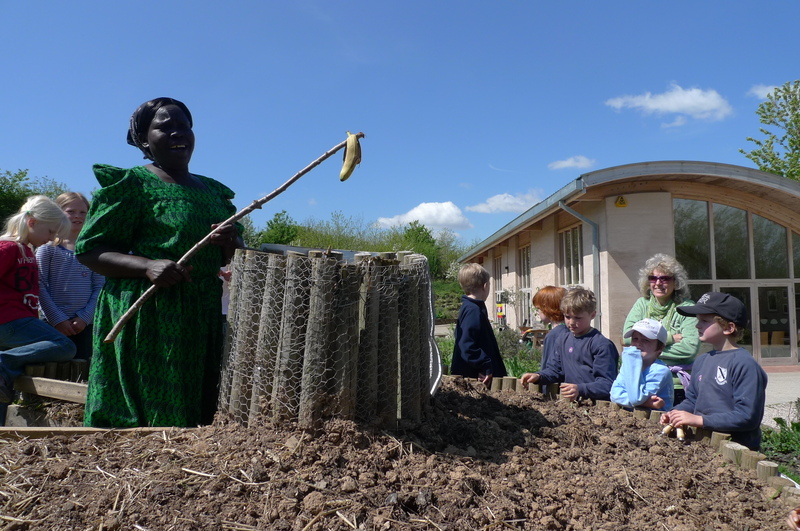 Huge thanks to all of our customers who have helped raise this, by buying garden fleece, boxes to share and referring friends to Riverford. 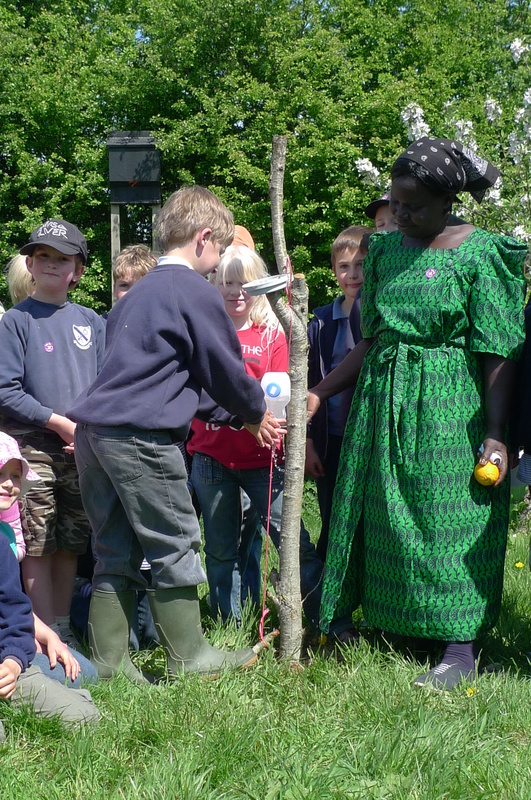 Margaret will be with us until 14th May and in this time we are hosting 11 school visits at when Margaret will teach children about sustainable farming in Africa. 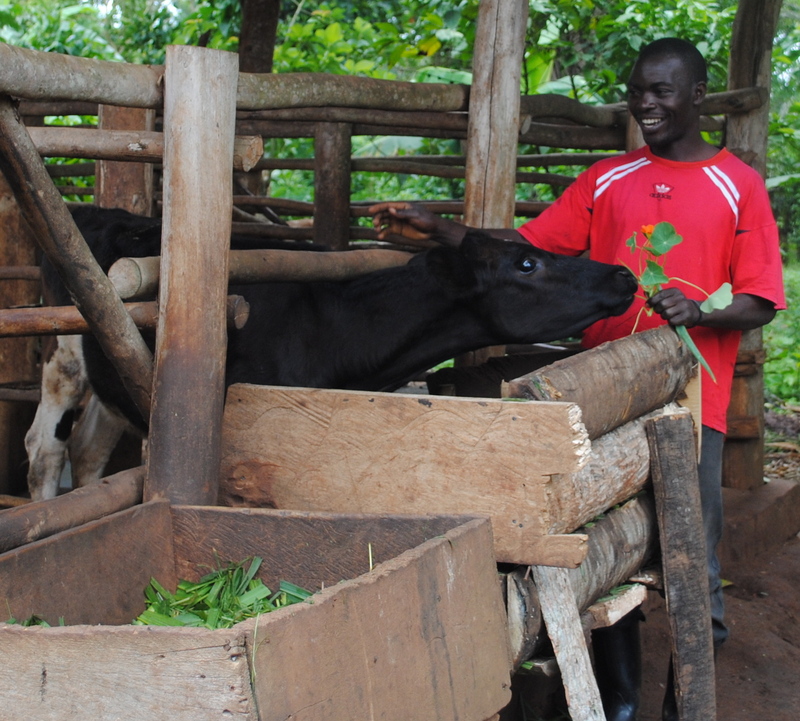 Margaret joined a Send a Cow group in 1998 and received training in agriculture. 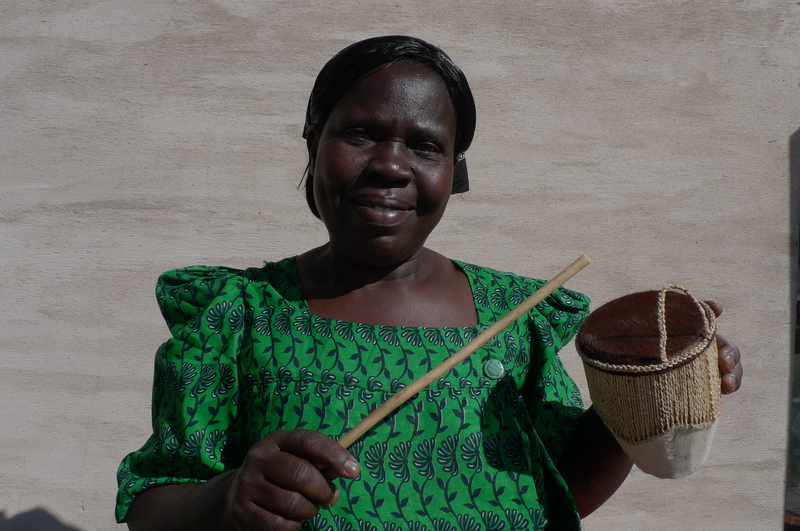 The group gave her a cow, which has calved 4 times. 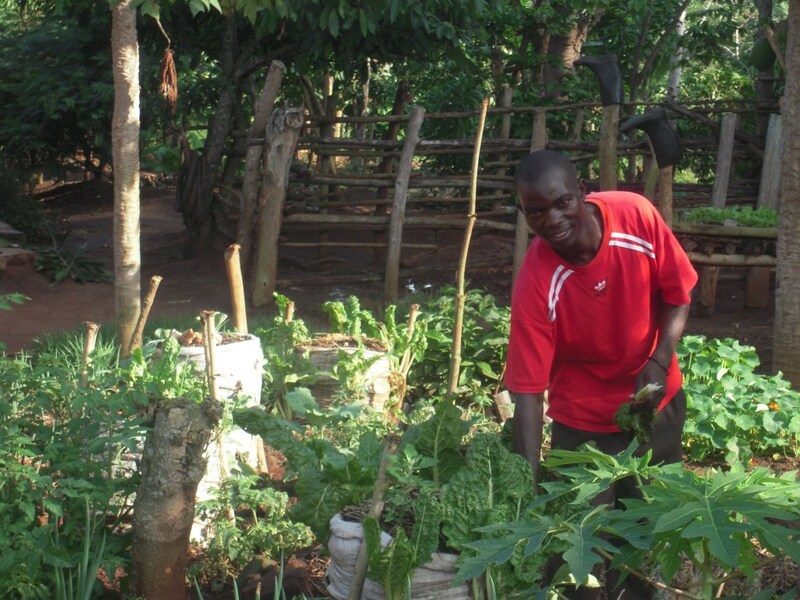 Margaret practices sustainable organic agriculture, which has improved her soil’s fertility. 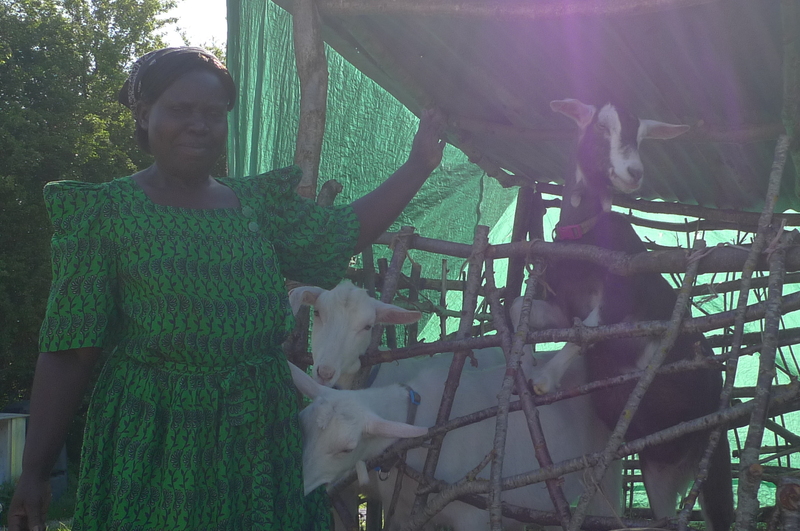 She is now a peer farmer trainer and has turned her farm into a training centre. 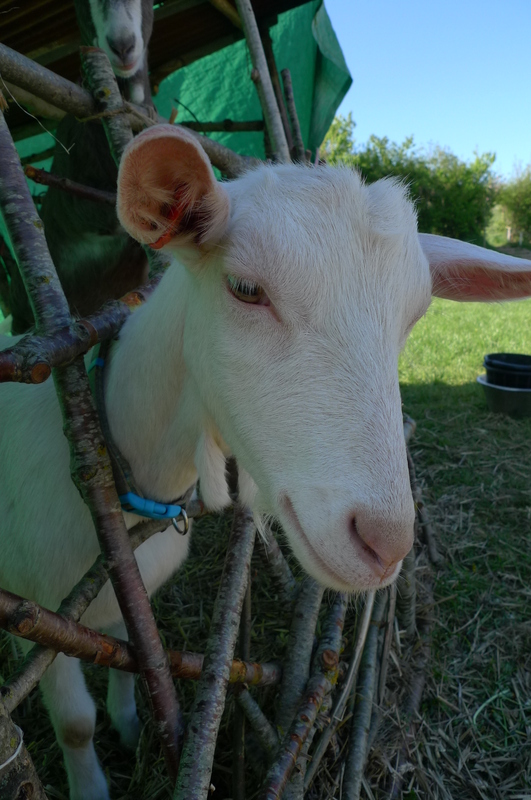 Fleece is a godsend to growers and gardeners; its use not only brings crops forward but also excludes pests like carrot and cabbage root fly and cabbage whites. 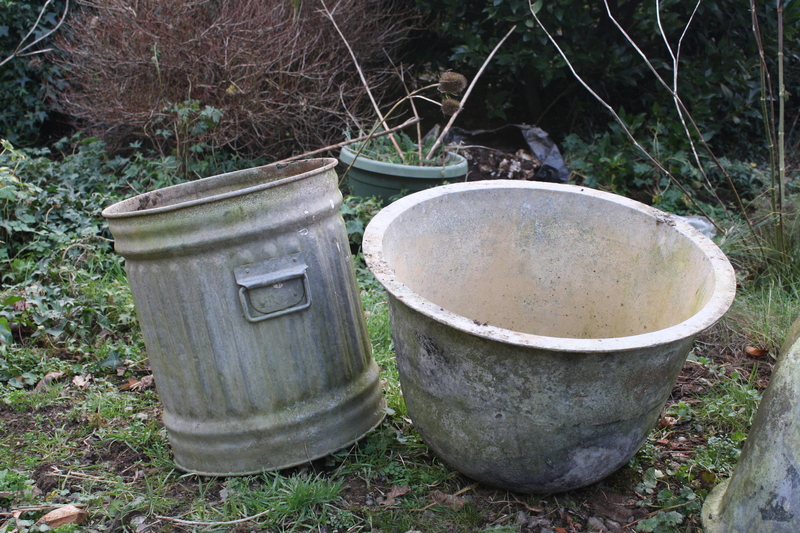 After the local deer, badgers and my dog have run over it we can seldom use it again on a large scale but it is still fine for garden use and a number of locals collect it for their gardens. 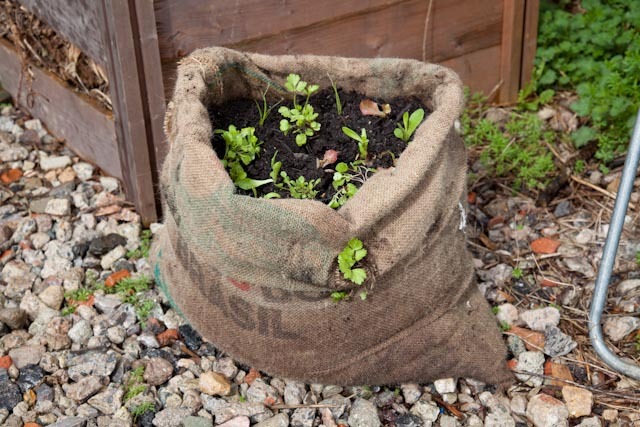 We will supply a vegbox of pre-used fleece (roughly 30-40 sq m) with a few tips on use for £4.99. 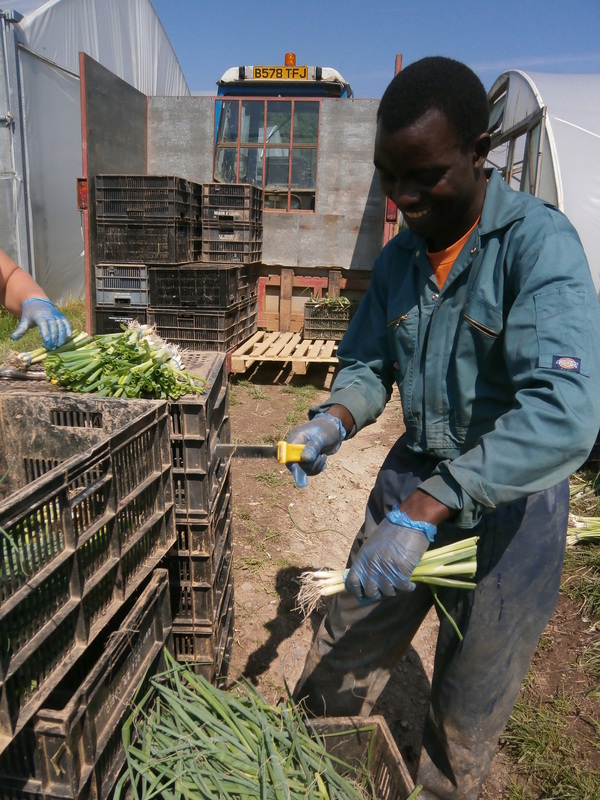 Any margin we get after cutting it up we will donate to Send a Cow.